Armenian Communities of the Northeastern Mediterranean is the fourteenth volume to be published in the UCLA series, Historic Armenian Cities and Provinces. Even though the northeastern reaches of the Mediterranean Sea were not a part of historic Greater Armenia, situated far to the east, this region around the Gulf of Alexandretta was home to Armenian communities since antiquity. During centuries of foreign dominion, religion was the primary marker of identity, as the Armenian cycle of life centered around the church and, in the modern era, also around schools and cultural-political associations. 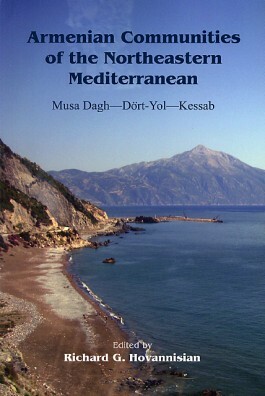 Although there were numerous large and small Armenian settlements and town quarters in the expanse between Cilicia in the north and the approaches to Lebanon in the south, this volume focuses primarily on Musa Dagh/Musaler, Dört-Yol/Chork-Marzban, and Kessab, with shorter excursions into Beylan, Antioch, the onetime Armenian villages of the Ruj valley, and several rather isolated existing villages near Latakia. In modern times, Musa Dagh, Dört-Yol, and Kessab have been the center of dramatic episodes in the history of the Armenian people. The heroic epics of self-defense might in themselves justify devoting an entire volume to an area far removed from the historic homelands and consisting of a number of relatively small enclaves. This collection of essays is intended to offer an appreciation of the these distinct communities in the Northeastern Mediterranean and the rugged, sturdy people who lived, and, at least in the case of Kessab and a single small village in Musa Dagh, continue to endure there.